Happy Canada Day!!! As you read this post I will be chillaxing on Prince Edward Island taking in the salty ocean air! This week's SHOPPING OUR STASH challenge is "Red, White & Blue" or in my case, just red & white. We want you to use red, white & blue OR your country's flag colours on your project. 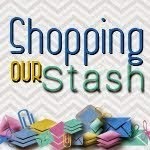 Check out all the details for the challenge on the SHOPPING OUR STASH BLOG and while you are there, show my teammies some patriotic crafty love!! 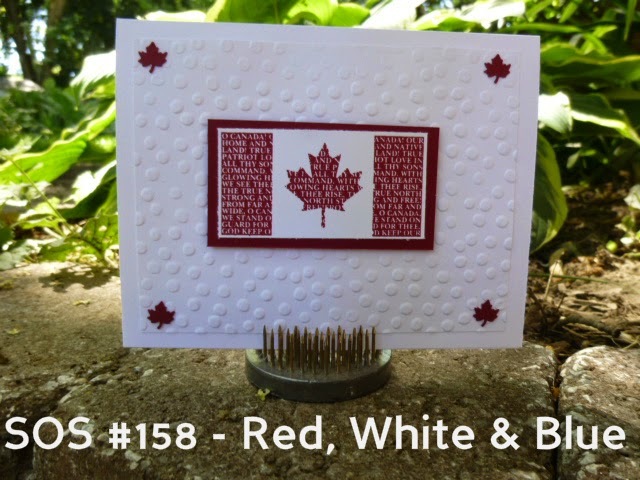 I found this CANADIAN FLAG CARD online and thought it was perfect for this challenge (helps that I have that same Canadian Pride stamp). By the time you read this post, this card will have hopefully made it's way west to Edmonton to my very special baby bird who will be flying home to Ontario this summer and I just can't wait to see him!! Perfect Canada Day ca Card. Very CAS you just let the flag shine. Happy Canada Day!! Very cool card, Donna! CAS done perfectly! Have fun on PEI! That is an awesome stamp! And JEALOUS of your vacation. Enjoy! Perfect card for us Canadians -- patriotic, but not over the top. ;) Hope you are having a perfect vacay! Aw, total perfection for your baby bird :) I just LOVE it!